"There is great power in the inability of theatre to create a complete illusion." In this short rubric, we focus on theatre and Antigone, an ancient Greek tragedy by Sophocles. Consult the "Exams" page of this website for a study guide of terms, works, and artists for which you are responsible. Scroll down for a reading guide and study questions. 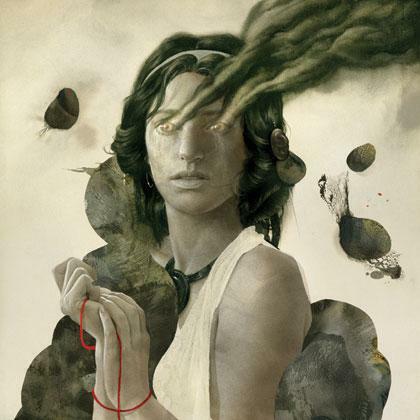 Read a summary of Jean Anouilh's Antigone here. The tragic hero should be a better-than-ordinary, yet imperfect, individual with whom the audience may sympathize (= the tragic hero should be relatable). The tragic hero should have a tragic flaw (hamartia), a weakness or imperfection that brings the protagonist into conflict with fate or with the antagonist, and ultimately leads to his/her downfall. Often the tragic hero's hamartia is hubris (= excessive pride). A tragedy must effect a catharsis in the spectators: an emotional release that comes from the spectators identifying with the suffering of the tragic hero. Sophocles' tragedies are concerned with flawed but virtuous human heroes. Are they willing to assume responsibility for their them? What are the consequences for those choices and actions, for themselves, their family members, their fellow citizens? If you're interested in the question of authority addressed in Sophocles' play, you may enjoy reading Autumn Bieberle's short article, "Antigone: True Authority." 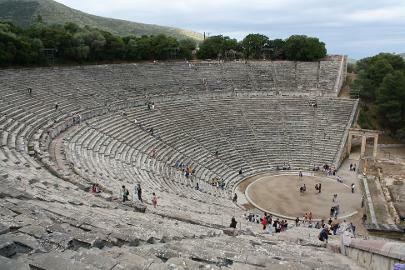 Greek tragedies and comedies were always performed in outdoor theaters. Early Greek theaters were probably little more than open areas in city centers or next to hillsides where the audience, standing or sitting, could watch and listen to the chorus singing about the exploits of a god or hero. From the late 6th century BCE to the 4th and 3rd centuries BCE there was a gradual evolution towards more elaborate theater structures, but the basic layout of the Greek theater remained the same. 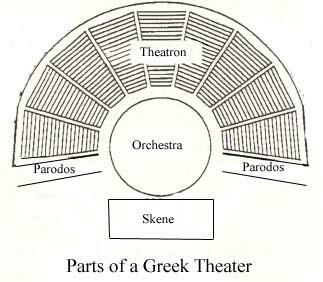 The major components of Greek theater are labeled on the diagram below. Orchestra: The orchestra (meaning "dancing space") was normally circular. It was a level space where the chorus would dance, sing, and interact with the actors who were on the stage near the skene. The earliest orchestras were simply made of hard earth, but in the Classical period some orchestras began to be paved with marble and other materials. In the center of the orchestra there was often a thymele, or altar. The orchestra of the theater of Dionysus in Athens was about 60 feet in diameter. Theatron: The theatron (meaning "viewing-place") is where the spectators sat. The theatron was usually part of hillside overlooking the orchestra, and often wrapped around a large portion of the orchestra (see the diagram below). Spectators in the fifth century BCE probably sat on cushions or boards, but by the fourth century the theatron of many Greek theaters had marble seats. Skene: The skene (meaning "tent") was the building directly behind the stage. During the 5th century, the stage of the theater of Dionysus in Athens was probably raised only two or three steps above the level of the orchestra, and was perhaps 25 feet wide and 10 feet deep. The skene was directly in back of the stage, and was usually decorated as a palace, temple, or other building, depending on the needs of the play. It had at least one set of doors, and actors could make entrances and exits through them. There was also access to the roof of the skene from behind, so that actors playing gods and other characters (such as the Watchman at the beginning of Aeschylus' Agamemnon) could appear on the roof, if needed. Parodos: The parodoi (meaning "passageways") are the paths by which the chorus and some actors (such as those representing messengers or people returning from abroad) made their entrances and exits. The audience also used them to enter and exit the theater before and after the performance. The prologue is spoken by one or two characters. It usually gives background necessary for understanding the events of the play. This is the song sung by the chorus as the first enter the orchestra and dances. The chorus usually remain on stage throughout the remainder of the play. Chorus members wear masks and dance expressively, using the hands, arms and body. There are typically 3-5 episodes in which one or two actors interact with the chorus. but rhythmic anapests are also common. In lyric passages the meters are treated flexibly. At the end of each episode, the chorus remains on state while other characters usually leave. The chorus dance and sing a stasimon, or choral ode. A stasimon is a choral ode sung by the chorus. It often comments on or reacts to the preceding episode, and puts it into a larger mythological framework. usually offering words of wisdom concerning the actions and outcome of the play. Antigone asks for her sister Ismene's help in burying their brother Polyneices. Ismene refuses, and Antigone rejects her sister. Creon enters, and announces his plan to bury Eteocles but leave Polyneices unburied. A guard enters, and reports that someone has tried to bury Polyneices. Creon reacts with anger, threatens the guard. Antigone is brought before Creon, and confesses that she buried her brother. She and Creon argue, Creon decrees she will die. Ismene is led in. When she claims to have helped her sister, Antigone rejects her. The Chorus reflects on the destiny of Antigone's house, fate, and the nature of a divine curse. Haemon argues with his father Creon, and leaves. Creon decrees that Antigone be entombed, alive. The Chorus sings a song about the power of the god Eros. Antigone, lamenting her fate to the Chorus, is led to the cave. The Chorus compares Antigone's fate and imprisonment to that of three others: Danae, Lycurgus, and Cleopatra. Teiresias enters, and tells Creon he has made a serious mistake. Creon realizes his error in judgment, and rushes to bury Polyneices and release Antigone from the cave. The Chorus calls upon Dionysus, the god who protects Thebes ("O you with many names..."). A messenger reports the deaths of Antigone and Haemon. Euridyce, Creon's wife, commits suicide. Creon laments his losses. 1. Does Antigone really expect Ismene to help her with Polynices' burial? 1. Identify three conflicts represented in this tragedy. Identify the scenes in which each conflict is played out. 2. What is the moral lesson being represented in this play? or heroic dedication to virtue? Explain your opinion. obeying established laws and human rights. 1. Antigone (to Creon): "What a person can do, a person ought to do." 2. Creon (to Antigone): "My trade forces me to be loathsome." 3. Chorus (to Creon): "Why must dirty work be done?" highest respect for the law." GROUP CREATIVE ACTIVITY: Antigone is right but Creon is not wrong! outcome that respects both moral authority and political authority. GROUP ONE prefaces their dialogue with this explanation: "In this text conversation that ends before the resolution, the communication isn't face to face. This makes the exchange between Antigone and Creon more difficult and less sincere. The way words are said means so much especially when what's being said contains very emotional content. Our version starts at the scene where Creon brings in Antigone, but in our story, they are in separate places. Therefore Creon can not physically arrest her yet. All he can do is threaten her and this gives Antigone a bit better of a situation. Our version of Antigone would like to avoid death it seems, and this is partly how a compromise is possible in our texting edition of the play." Antigone: Wut up boss, you busy? Antigone: K. 🙄 I don't like the way you did P dirty. Antigone: P was my bro and your nephew and he deserves better! Antigone: OMG WTF😡he won't find peace in the afterworld and might be stuck in purgatory if you keep him unburied. Creon: I hold the final say, little girl, just because you are marrying my son doesn't mean any different about you breaking the law. Antigone: I want to bury my brother. Creon: He cannot be buried. He committed treason and I must make an example of him. Antigone: Why do we not come to a compromise and put moral and state well-being together. He should be buried, but his grave marked as to show he is a traitor. That way he may still pass into the afterlife, and an example is still being made of him so you authority goes unquestioned. Creon: NO! Treason deserves death without a proper burial! I will allow to woman to undermine this! Antigone: I am a woman, but I'm not undermining your authority with this compromise. If anything, this compromise adds to your integrity as king because it shows you respect the ancient truths of proper burial and morality, yet still punish those who deserve it. Creon: Compromise does not befit a king. Undermining one facet of my authority undermines all of it. I cannot relent. But I can convince the public of my complete control by improperly burying an imposter in your brother's stead while giving Polynices a secret but proper burial. Alas, I'll marry with reluctant glee.